An innovative city building political strategy game with match-3 tower defense combat. 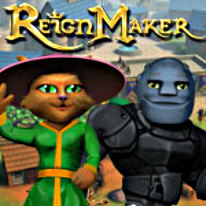 ReignMaker is a city building political strategy game with match-3 tower defense combat. From your capital city you lead your Kingdom against the invading Void Army that threatens all life.Your strategy, tower defense, and match-3 skills will determine the fate of your armies, but the many political decisions you make as a leader affect the story and the culture of your kingdom. As your capital city improves, you will have access to more powerful spells, mightier elite troops, and better battlefield gear and armaments. -50 towers across 3 continents with variety in match-3 board configurations. -Beautiful and detailed city building as you progress. -Millions of story possibilities determined by your policy choices. -20 spells, 10 types of troops, 12 implements of war.